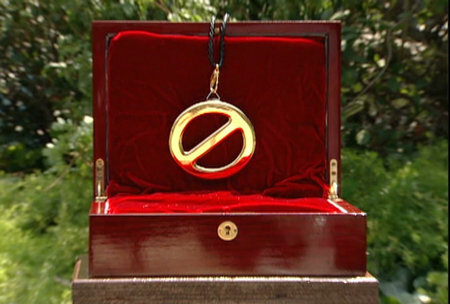 Another Saturday is upon us this summer and that means it is time for the Power of Veto to play out in the Big Brother 2014 house! Again, it is a crucial competition and the winner will help determine where this week goes, but then no one truly knows how it is going to go right now! Big Brother 16 switched names to “The Frankie J Grande Show” last night, so I guess it all depends on who he wants gone and will make him and all his “followers” happy? Check out the players for the Week 7 Power of Veto competition below in our Big Brother 2014 spoilers! What does this mean? No clue! These past 24 hours have been quite interesting and now it looks like Derrick and Cody might be going after Donny, but only because he is on to them and they can’t let that possibly happen! Derrick was telling Frankie to slide into the shadows for a while and it will all blow over. Donny needs to win or he could be going home, but then the same could be said for Zach. Nicole could be a possibility for Donny, but I think Derrick could talk her out of it….hoping the comp starts soon! Sick of these late night comps. I’m glad Nicole gets to play. It’s a possibility she will save Donny if she wins. As of an hour ago, Derrick stated that they need to evict Donny this week. Of course that may change but i’m worried for Donnys safety. I’m worried as well Cat. This may be getting boring, but my fingers and toes are crossed for Donny to win. I am very, very worried too Cat, Fingers, toes, eyes, legs everything crossed for Donny to win. This time it might even be worth keeping my eyes crossed even though my mother kept warning me they might get stuck that way! Praying for Donny win!!!!!!!! Hoping for good news when I get home from work, don’t disappoint me. Joining you in your prayers, Tommy! It would be so wonderful to see a deserving person like Donny win this year especially after the travesty of last season. Tommy/Tessa, Permission to join you both in prayers, Indeed it would be wonderful to see a wonderful, sweet, kind person like Donny win this year. She did it AFTER the comp. Which leads me to believe it holds no power for during the comp. Hey i’m willing to give ANYTHING a try for Donnys sake. Me too gals, I’m with you 100%!!! I would have no clue how to do that chant. If my life depended on it, I couldn’t do it. We all would sound like a bunch of chattering squirrels. Or maybe just a bunch of nuts! Oooo yes. Here they are! I have a rat or two. A cheap woman doll with long hair. A couple of forked-tongued devils. … And some looooooooong-*ss pins. I even have extra for Cat. I’m good to go!!! Hey wait. We talking 9:00 eastern time or central?!? Well i was thinking eastern time but if yours is different i’m willing to compromise. Or we could go by BB time but it’s not yet 5:30 there! I’ll be here whenever they go to fish! But I’m not on the feeds so give me a heads up! Well yes those dolls appear to fit nicely with some of the hg a this season too. I’m very recycling conscious…. Frankie won’t be playing or hosting the POV comp!!!!! Hope Donny or Nicole win! I wish they could make him go sit in the corner–I don’t even want to see him on the sidelines! I think you have a sure winner there, SAWVA! TOO much suspicious activity. Monkey in the wood pile somewhere…..
A monkey with a pink topknot?? This doesn’t bode well for Donny but keeping everything crossed and praying for him to win. This show is a farce!!!!! HGs don’t run the house. CBS and production run the house and the HGs are THEIR pawns!!!! Who do you think Christine will put up if the veto is used? And the POV winner is…….? Big Brother has been known as the Frankie J Grande show ALL season. The show has favored him all summer. His coming clean is nothing but “good TV” for CBS. I am not impressed and I hope he does not win. He has been playing for more fame and not for the game. I really want Donny to win! The editing has certainly given him more air-time than anybody else in the house. Did anyone else see hear Frankie when he was going to tell his story to the girls that he didn’t want to tell them in the bathroom because the camera angles weren’t “good” ? Hmm…methinks a bit of Production-prepping happened. no one can have a convo without frankie showing up for some stupid reason or another. Like I have said production and CBS run this house!!!! So sick of hearing about Frankie and his big confession!!!! It is all over the internet and it is sickening!!!! I hear ya Darla, Someone said the show has turned from Big Brother to “The Ariana Grande’s Big Brother Show” lol. Too late….they are on the Jeff loop right now. Don’t know if it’s the veto being played or the have-not food being revealed. I’m thinking (and hoping) veto. Yes, I saw that dag nab it! Cat, Christine is a lying witch. Are those voodoo dolls ready? I’d love to use one on her! Poor Donny, a have-not, he needs to save his strength. It WAS ready but i have to keep changing the carrot that i used for her nose. It keeps getting longer and longer each time she opens her mouth. CAT!!! You are one funny lady. That is the funniest one yet hahaha!!!! I will take me Caleb in the love sick mode and make Frankie go away! D a m n, what an ego. right in the kisser! Take that you skinny pretentious pompous a$$. JMHO -1st ammendment: this is America, not FrankieLand. Now that is a fantastic idea, I’d just love to see Frankie deal with the Hantz family. Did anyone get any further explanation why Donny told Nichole that he really quit his job to be on BB? It wouldn’t surprise me if he had to “resign” in order to begone that long. But then they could rehire him if he didn’t win the money. Not that I know of but he loves BB and wanted to go on it so badly. He isn’t getting any younger and I guess before he settles down with his girlfriend and maybe starts a family, it was now or never. I can’t see him having any problem getting a job once this is over. It could workout for the best. Frankie has a job he can go to now. He can be that schools c r a p picker upper. He is full of s h I t and should be great at it. Bring in the Hantz family…they would set this house straight!!! Still Jeff and amber on the feeds …. Pov still happening. Voodoo dolls are begging for mercy here!! None here. And Cat’s so dedicated she doesn’t even have time to comment! Well, that’s dedication for you. Good for her!!! mz_mozie, We are will to do anything for Donny to win the veto comp. Yes we will. Voodoo dolls… Prayers…. Heck, some bob fan around here is doing a very successful rain dance!! Let’s hope it helps in California. We developed new skills needed to survive BB15, moxie! Turns out they’re valuable again this year! Pmsl, using voodoo? What about sending vibes to MrSockMonkey to sock-knock some sense into Calebs ego-filled-and-oh-so-sad brain? This might top 2013 if Craz-tine isn’t shut down. Hey if you have psychic abilities with sock animals, what the heck are you sitting around here chatting for?! Get busy!!!!!!!! Umm…er….is wishful thinking good enough? When do we find out who won!!?? When the live feeds come back on. Todd will see who is wearing the necklace and post an update. My guess is he has it partly written waiting for the final details! And yes we’ll take positive thoughts too. I’ve had it!! Pretty darn spunky, if I do say so myself. Who do you think will be the FF? ARe we sticking needles in anyone in particular tonight? Only people whose names start with C or F. And maybe a Z or a D. And that are hgs on a tv show. Know anyone like that? Definition of insanity: watching the Jeff-Amber interview feed loop expecting to ever see live again. Or just watching the Jeff-Amber interview feed loop…. I was debating that very thing. G’night. I’m here. But fading fast. I missed so much going to bed early last night…. Will do. I’ll have to plug in my iPad though…. Hi Joyce!!!! Has the ambulance arrived for Christine yet? Did i miss it? Or should i start disrobing again and look for more pins and carrots? It is both insane and nerve-wracking waiting for veto comp results. Ha!! Are you ever NOT funny? Yep. He’s wearing the necklace. you batted 1000 last time, my money is on you. Don’t make me say it out loud 🙁 ….or type it. I may not even watch it! I wrote a long “how I felt” but will post it at another time. Have a cool drink and try and adjust. It ain’t over till it’s over as the old boy used to say. who knows….this is so confusing at times….my other post was removed…guess I should not have given a spoiler…sorry guys!! my post was removed…guess I should not have given a spoiler…sorry guys!! My thread automatically resets to “older” every time. So maybe it just moved. My phone does the same. 🙁 Annoying!! to stay. I think it is time to lose Frankie.